Today, I am showing you a shaped card with a sweet fox from the Outdoor Play - Critter Stamps & Dies set, for LDRS creative. The image has been coloured with promarkers. The shape of the card has been created with Grace Build-A-Card Die Set. The doilie under the image has been created with the Dotty Doily Die Set. The papers used are from the Daisy Daisy - 6x6 Paper Pack. 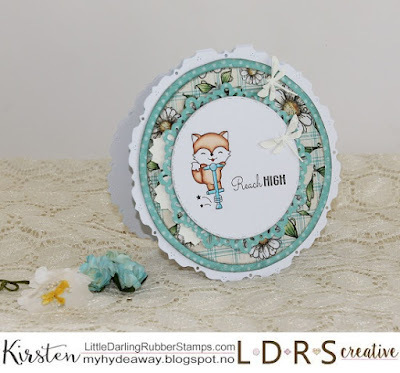 The dragon flies has been created with dies from the Allifair Build-A-Card Die Set. The back of the card has also been decorated. I have used a banner from the Fancy Rectangles & Layers Die Set. 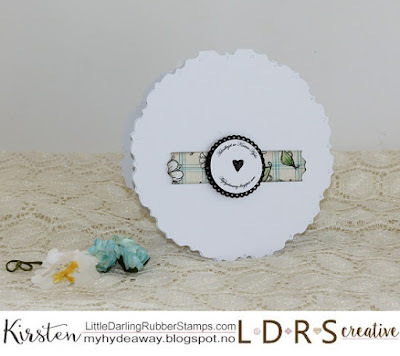 The black circle has been made with a die from the Hooty Owl - Stamps & Dies.